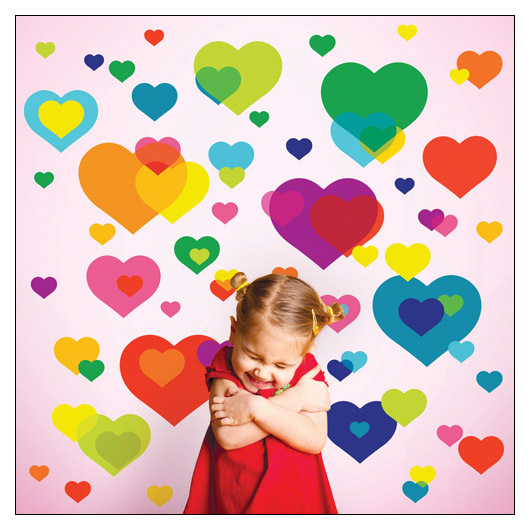 Overlapping Hearts Reusable Decals by Wallcandy (WCOH) at Pure Design Kids / Toys / Wallcandy ::: Kids' Toys, Furniture and More at Pure Design Kids! Feel the love with over 50 single and overlapping hearts in bright colors! Ranging in size from 1.5" W to 12" W, the whole family will LOVE designing with these removable heart decals. Please allow up to 2 additional weeks for delivery. This item can only be shipped to the "lower 48" United States. Sorry, this product is not available until March. Please call 800-483-5643 if you would like to pre-order this item.